Key Performance Indicators (KPIs) are measurable data that companies use to track and evaluate strategic activities and business objectives. KPIs are important to businesses because they provide context to organizational goals and place accountability on those tasked with achieving those goals. While small business owners usually have no problem creating KPIs for sales and production, deciding how to track and measure digital marketing initiatives can be more cumbersome. As technology becomes more integrated into our lives, so too is the importance of having KPIs for your small business’ digital marketing. Every small business should use digital marketing KPIs. While every company will have their own digital marketing KPIs, understanding some of the most popular ones can help you get started with tracking and measuring your digital marketing initiatives against your business goals. Measures: The number of email recipients who opened an email. Calculating Open Rate: Most email marketing platforms provide open rate statistics on each email campaign. If you want to track open rates on individual email correspondents, try using a tool like Yesware. 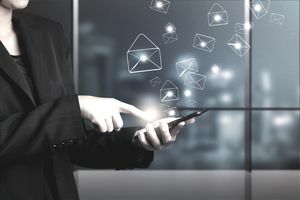 Why it’s important: Understanding and using email open rates can help you improve your email marketing activities and discover trends that lead to more email engagement. Measures: The cost you pay for each unique visitor from an online paid media ad. Calculating CPC: Most paid media platforms (Google AdWords, Facebook Ads Manager, Outbrain, etc.) have an analytics report that shows your CPC. You can also use Google Tag Manager and your digital marketing budget report to assess CPC from other paid strategies. Why it’s important: Knowing your CPC and creating goals using this marketing metric can help you optimize your paid media activities. Measures: The cost you pay for each conversion or acquisition. A conversion or acquisition could include activities like: calling your business, completing a lead form, downloading an eBook, purchasing a product, or any other number of user actions. Calculating CPA: Where CPC calculates traffic, CPA measures activity. To calculate CPA, you need to track conversions either through the paid media platform, web analytics software, or manually. You will then take the total amount spent on advertising that campaign and divide it by the total users converted. Why it’s important: Understanding your cost per acquisition and creating a targeted average CPA will help you assess the return on investment from your advertising activities. Measures: The percentage of people who see your advertisement, inbound link, post, or search result snippet and then clicks it to navigate to your website. Calculating CTR: Most communication channels will provide a CTR for each marketing activity you execute. If a platform doesn’t, you can look for the total impressions received, and use Google Tag Manager to calculate the traffic from that link. Why it’s important: A low CTR indicates that people see your post or ad, but are not compelled to act. By measuring your CTR, you can adjust ad copy and marketing messages to entice more people to click on your links. Measures: The number of internal links pointing to your website from another site. Calculating Inbound Links: Use an SEO tool like Ahrefs or SEMrush to crawl the web for links pointing to your domain. Why it’s important: Inbound links are one of the most powerful ways to grow your online presence. You should be working to increase the number of links pointing to your site by creating link-worthy content and conducting link earning/building outreach. By tracking and creating goals for total inbound links, you can help improve your organic rankings and drive more traffic to your website. Measures: The number of users who visit your site through organic search, referral links, direct URLs, or paid channels. Calculating Monthly Website Traffic: Use Google Analytics to calculate your website’s total monthly visitors. You can also drill down to specific acquisition methods to determine what channels drive the most traffic. Why it’s important: Knowing the total amount of traffic you receive every month and the channels they used to find your website provide you the insight needed to measure the effectiveness of your different marketing campaigns. It also helps you find opportunities to increase the amount and quality of your visitors. Measures: The percentage of users who leave your website after only visiting the page on which they landed. Calculating Bounce Rate: Use Google Analytics to track the bounce rate across your entire site and on the specific pages for which you are running targeted marketing campaigns. Why it’s important: Bounce rate indicates the user-experience on your various pages. If visitors are leaving your site after only visiting one page, you need to assess whether that page is under-optimized, if you’re bringing the wrong audience to your site, or why visitors are not engaging with your other pages.